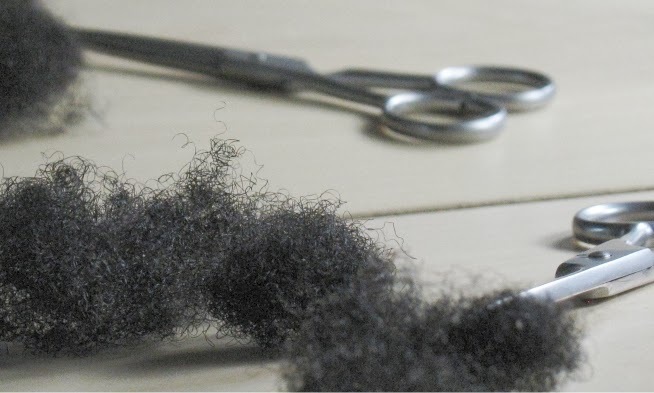 Following a reader question, here are a few videos and links on how to self trim without using heat. ShidaNatural - There is not much talking in the video but the idea is to do several small twists and clip off whatever you want. African Export - Video is super informative. She shows how to trim and how to cut layers. She does have a looser curl and knows how to handle her own hair so I would not recommend that you copy the layering technique unless you have a similar curl! Rustic Beauty - I would not do the fine comb portion in this video but the rest is excellent. Naturally if your hair is more breakage resistance and you have not had any issues previously with fine tooth combs, then do go right ahead. See the video on youtube. Sag mal, JC, many people are cutting twists and I have read on a children's site that some stylists don't recommend cutting braids. Do you think that cutting braids is just fine? Better? Or do you specifically advise braiding just to determining **how much** hair should be cut off? My daughter has LOTS of very dense very THICK 4bc hair. LOTS! I don't see the issue in cutting hair in braids specifically for highly textured hair. I also have lots of 4abcxyz hair. I have cut my hair in this way for atleast 2 years with no issues. The braiding (i.e relatively small in size) helps to control the volume of the hair and also helps to visualize the tapering better. I think the one strong recommendation I would make is to get some hair cutting scissors. They are sharper than ordinary scissors and therefore do not fray the hair when cutting. I cannot think of any reason why cutting twists or braids would be bad. Did the stylist give an explanation? Sorry, I don't know why the stylist said that. I've got the scissors so I'll try cutting in braids soon. Thanks again! Probably stylist jealous and want your money and then she'll probably cut off too much and use the excuse your hair is really damaged to justify a cut as opposed to a trim...just my opinion based on real life stories! I agree, go to Sally's and purchased a nice pair of hair shears, your coils will thank you! Why am I just now seeing this post?! (See what happens when I go on vacation and I'm not near a computer and then I'm featured on a blog that has been so helpful to the care of my hair and feeling like I'm all late and wrong with my appreciation... Okay, enough fussing at myself for now LMBO). Thank you, Jc for featuring me on your blog *doing an old-school dance*! This is super cool to me and it is going to be a while before I stop sportin' this "Kool-Aid" grin I have going on, but IDC LOL :-D!